Another Make It Monday challenge from Papertrey Ink. This week the challenge is to make something using paper scraps for the background. Well, let me tell you - have I got scraps! I don't throw out any of the beautiful bits and pieces left over from a project - be it paper, fabric, felt, ribbon ... You get the idea. I think I get this habit from generations of savers. My grandfather, orphaned during the Great Depression, saved every nut and bolt in baby food jars. If you needed anything, go ask Pap Pap and rest assured he'd have it or something that would do just fine. This sweet thing is destined for my Send Love Today assignment. I plan to tuck a packet of lotion in the card as a special treat. All paper (except the white card) is from my scrap collection. 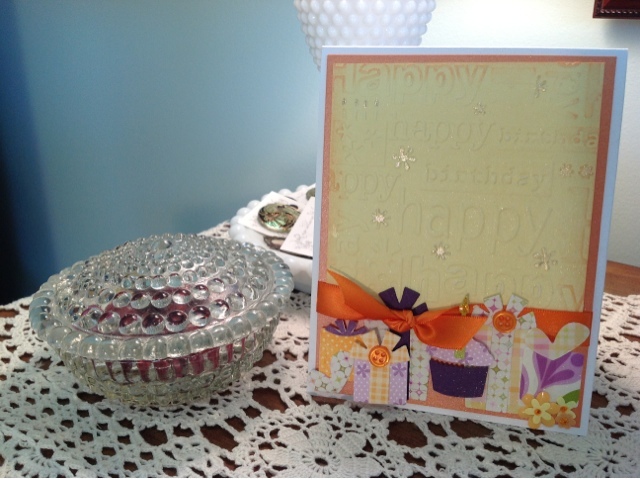 I often incorporate scraps into my cards. 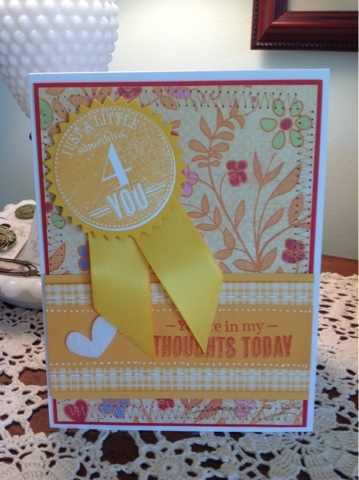 It's really easy with so many lovely border punches, die cuts and such. The challenge is in storing the scraps so they don't get lost or end up all over the place. I have found the simplest way to store scrap paper is in a binder. 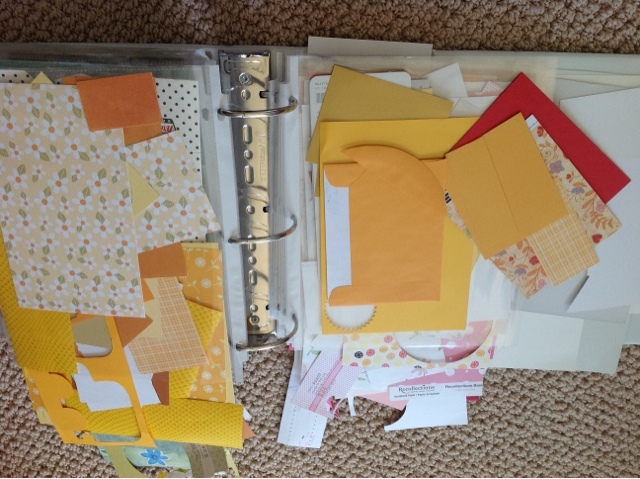 I place the scraps in plastic paper protectors organized by color. Pieces of felt and buttons are likewise stirred in jars organized by color. 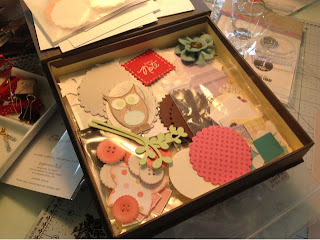 Ribbon is stored on little spools in a plastic organizer and fabric bits are stored in baskets. I don't throw anything away until it's nearly a speck. 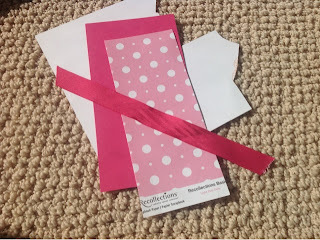 inexpensive and easy way to organzie left over paper scraps. 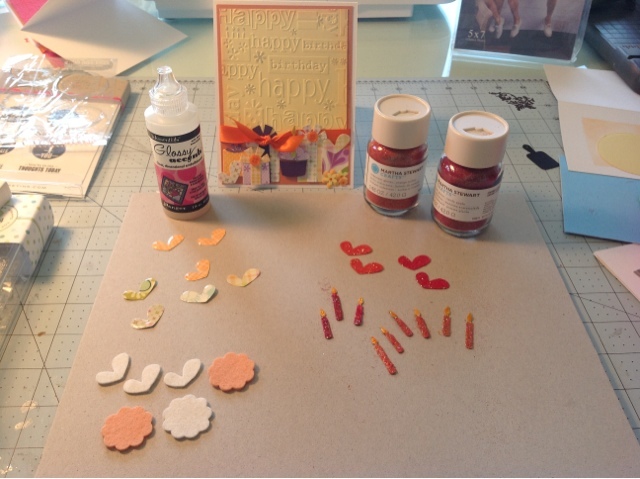 Little scraps become itty-bitty adornments in future projects. 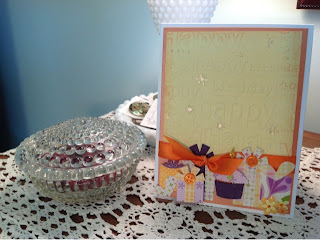 I often use Glossy Accents or fine glitter to make the die cuts extra special. Pre-cut die cutouts from paper scraps just waiting for a project. finds in this birthday menagerie. Stop back tomorrow to see what this collection of pink paper scraps turn into for Mother's Day. Any guesses what these bits of scrap paper and ribbon will become? Sweet, sweet card! I love the encouragement it offers. :) I like your blog music, too!